Like most of my fellow Dreamers, I did not understand what being “illegal” meant until I started applying for higher education. I graduated high school the summer of 2008 and quickly realized that my dreams of being a college graduate were at risk because of something I didn’t completely understand. Against all odds, I put myself through college. I worked 40-hour weeks as a server, under terrible conditions and with no hourly pay. I went to a private university; with scholarships and full support from my professors, I graduated in 2012. I have a bachelor’s of fine arts — it took work, blood and tears, but I made it just in time for the DACA permit. I moved from Texas to New York City to pursue my dreams, and I’m currently able to support myself and my mother thanks to my work permit. I’ve been advocating for and educating my family and community about immigration rights since high school. I have watched in horror and despair as my community gets terrorized by the current administration, and although it is hard and overwhelming at times, I want everyone to know that we are not afraid. We Dreamers are made of something different. We are the culture and blood of our origins, but we are also the promise and future of this country. We are Mexican, we are Latinos, we are Asians, we are Muslims, we are Everyone, and WE ARE NOT AFRAID. We are educated individuals ready to fight, because we don’t know anything else — we have been fighting since we were born. Fighting to keep our cultures and traditions while being American, fighting to make our families proud, fighting for our space in this country, fighting to never go back into the shadows again. And we will keep fighting. NO ME CALLO, NO ME SIENTO, NO ME VOY. 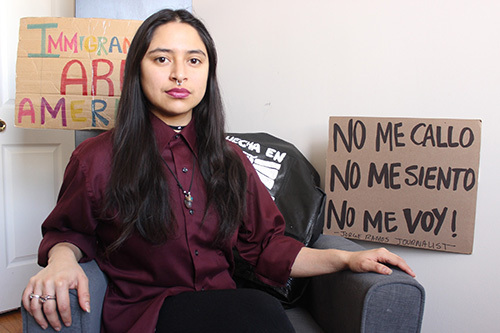 Gloria Mendoza is a DACA recipient living in Brooklyn, New York. To learn more about what you can do to help people like Gloria, visit www.nilc.org. And you can do more: Call Congress at 1-478-488-8059 and insist that your senators and representatives support and vote for the bipartisan Dream Act now! This entry was posted in Uncategorized on February 20, 2018 by Richard Irwin.